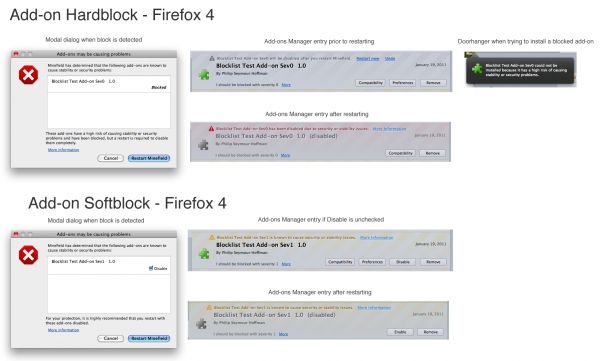 Blocklisting is the ability to disable errant add-ons and other third-party software for Firefox users. For graphics drivers, please see this policy. No matter how secure, fast, or stable Firefox is, one encounter with bad third-party software can cause permanent damage to Firefox, your computer, or worse. That's why Mozilla considers it our responsibility to help users avoid those encounters. One tool we use to do that is blocking dangerous third-party add-ons and DLLs from running in Firefox. Blocking third-party software is a sensitive issue that must be carefully considered in every case. We must be certain that the issue at hand is so great that it outweighs the user's choice to install the software, the utility it provides, and the vendor's freedom to distribute and control their software. A history of security vulnerabilities. Severe performance impact (e.g. adds more than 75% to start-up time). Severe bugs that unintentionally affect core Firefox features. Note: The above conditions assume users have chosen to install the add-on or software in question. If the software is installed without user consent, the bar is significantly lower to blocking for the above and other reasons. Inclusion of advertisements or other "spyware" tactics, unless users did not choose to install the software or were not made aware of the offending functionality. Intentional significant changes to or breakage of core Firefox features, unless users did not choose to install the software or were not made aware of the offending functionality. At request of the vendor/developer, except in extreme circumstances. There are several levels of blocking available to add-ons and plugins. Hard-blocks disable an add-on and do not allow the user to enable it or override the block. This should only be used in cases where an add-on is malicious. Soft-blocks disable an extension by default, but allow the user to override and continue to use the add-on. This is the preferred block type for extensions which are not malicious. Click-to-activate blocks disable a plugin by default, but allow the user to enable the plugin for particular sites. This is the preferred block type for plugins which are not malicious. Software should not be blocklisted without a reasonable attempt to contact the vendor/developer beforehand to alert them of the block and request a fixed version. If a fixed version will be provided in an adequate timeframe (0-3 calendar days), the block should be held so that users can update to the fixed version. Block ranges should be as specific as possible to only target the offending versions in the affected application versions. If there is an existing bug to be morphed into a blocklist request, make sure the required information (indicated in the request template) is included in the bug before moving it to Toolkit :: Blocklist Policy Requests. Please do not move bugs to Blocklisting until they are ready for blocklist consideration. The vendor or developer of the item in question will be contacted, directed to the bug, and encouraged to fix the issue. This page was last modified on 7 March 2019, at 20:22.